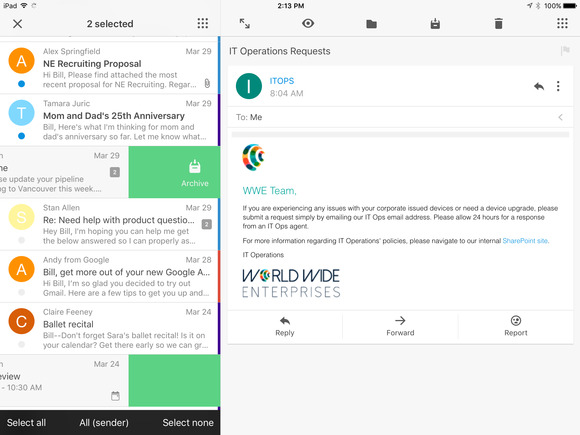 It seems like every major tech company needs to have an email app these days, and VMware is no exception. The company launched a new version of the Boxer iOS app on Tuesday for companies using VMware to manage their employees' mobile devices. The resulting app, appropriately called VMware Boxer, is now available for AirWatch and Workspace One customers. It's designed to replace Apple's built-in Mail app on the iPhone and iPad, in part because it's packing some key additional features. Boxer includes support for all kinds of customization including the ability to take different actions by swiping email messages, bulk edit messages and even change the sound the app makes when a new email arrives. It also includes calendar functionality, so users don't have to leave the app to see their schedule. Boxer was acquired by VMware last October, after a long history as a popular email app for people who want more than just the default application that comes with their smartphone or tablet. Consumers who continue to rely on Boxer for their emails will still get regular updates for the application, according to Andrew Eye, the former Boxer CEO who became vice president of strategy at VMware. In an interview, he said that consumers and most commercial users will get updates on a fairly rapid release cadence. For businesses that want more time between updates, VMware will also release a special build of the app that will let them move a bit more slowly. VMware Boxer competes against a bunch of other email apps, including those produced by Microsoft and Google. One of the key benefits VMware has in this regard is that Boxer will be available for free to AirWatch users on the orange, blue and yellow plans, and easy for them to deploy from their device management console. That may help AirWatch win additional clients, since email is often one of the most important work applications someone can have. Companies with other enterprise mobility management services will still be able to manage the consumer version of Boxer, which has supported that functionality for a while.